The Fenix PD25 is an amazing tactical flashlight that has proven to be reliable in the hour of need and in tough environments, too. Working outdoors and in the cold can be very difficult. If the flashlight is not well built, it will not work or just function for a few hours before running out of power. This is not the case with the Fenix pd25 flashlight. Not only this, you can use this as an everyday carry flashlight or emergencies. The PD25 has maximum 550 lumens, 4 modes, reverse polarity protection and lots of advanced features. Read this Fenix PD25 review to know more about this flashlight features. If you are a law enforcement member or a security guard, then you need a powerful flashlight like this Fenix PD25 flashlight. You need to have this kind tactical light with you and always be prepared as you don’t know when you will be ambushed by burglars or assassins. For the years that I’ve been in this practice, I have encountered different types of flashlights. Some flashlights have lived up to the hype while others have not. Actually, I always carry two flashlights with me. These include a floodlight and a small LED flashlight. Of all the everyday carry flashlights that I’ve used, I came to fall in love with the Fenix pd25 flashlight. Fenix pd25 is made of durable aircraft grade aluminum. It has a hard anodized anti-abrasive finish that defies rust and corrosion. The 550-lumen flashlight uses Cree XP-L led bulb which is indestructible. The side switch is simple to use and allows the user to cycle through different light modes. You can decide to switch on low, high, medium, turbo or even strobe mode. Strobe mode is very beneficial to me as it can assist in blinding an attacker before I take any other action. The Fenix pd25 is well suited for security and law enforcement. The reason behind this is that it is built for tactical use and can survive in tough weather conditions like rain with the IPX8 waterproof ratings. In addition, it is scratch resistant and can resist impact of up to one meter. Use the flashlight as you go camping, hunting, hiking, fishing, bike riding, and as well as kayaking at night. Made of durable aircraft-grade aluminum, pd25 550 lumen flashlight is strongly constructed to perform excellently for many years. Also, it has a toughened ultra-clear glass lens with anti-reflective coating. This protects the CREE XP-L LED bulb inside from being damaged. The lens as well helps in illumination and throw. When it comes to the finish, this flashlight is made of premium type III hard-anodized anti-abrasive finish. This protects the flashlight from rusting. Having a simple to operate switch can be a great deal if you are in danger or want to access the flashlight quickly. The Fenix pd25 LED flashlight is very easy to use. It is easily switched on/off through the tail cap switch with the momentary function on. To access the 5 light modes that this light has, you will have to cycle through the side switch based on the head of the light. You can use it to select low, medium, high, turbo, or strobe light modes. This is a wonderful everyday carry light from Fenix. 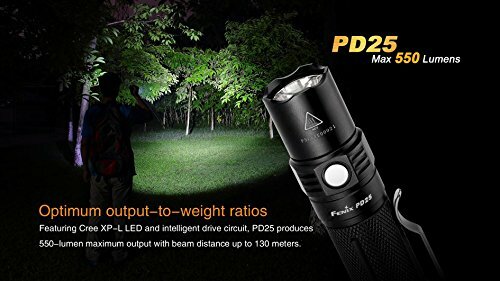 The pd25 flashlight weighs 47 grams without battery. Also, it measures 93 mm in length and 21.5 mm in width. This is very light and compact, respectively. So, you won’t have a burden of handling this flashlight while on duty. A flashlight is no good if it doesn’t offer you the brightness that you need. Before looking at other features, you should always ensure that the brightness level is good for your tasks. The pd25 torch is very bright with a maximum of 550 lumens. This covers a maximum distance of 130 meters which is great. Also, the flashlight uses CREE XP-L LED bulb which has a lifespan of 50, 000 hours. Moreover, the bulb is indestructible and will serve the user for at least 5 years. 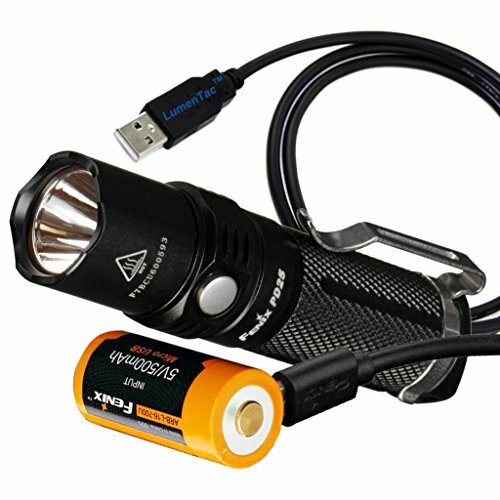 If you need more powerful flashlight then you should look at Fenix uc35 flashlight or should choose from popular list. Fenix provides the user with different lighting options as it has 5 different light modes to select from. These include low, medium, high, turbo, and strobe modes. The low mode has 5 lumens and runs for 100 hours. Medium mode has 50 lumens and runs for 9 hours 5 minutes. The high mode has 150 lumens and runs for 3 hours 15 minutes. The turbo mode has 550 lumens and runs for 35 minutes. The type of battery used as well determines the run-time of different modes. The one 16340 rechargeable Li-ion battery is drained quickly when compared to 3V CR123A lithium batteries. This flashlight comes with a low voltage warning feature that notifies the user when the battery is about to run out. This is a nice feature as it avoids draining the battery completely which can lead to spoilage. Fenix pd25 LED flashlight is weather resistant as it has a waterproof rating of IPX8. This means that it can be submerged in water up to 2 meters for 30 minutes without getting damaged. This is another excellent feature which prevents the flashlight from being spoilt. People do misplace the battery when in a hurry and this can end up damaging the flashlight. 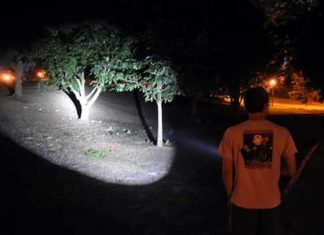 When the flashlight is used on high, turbo or strobe mode for long, it tends to heat up which can damage the flashlight. The over-heat protection prevents the flashlight from overheating and the user can continue using it for long hours. The flashlight gives the user the opportunity to use either one 16340 rechargeable Li-ion or 3V CR123A lithium battery. If you want an extremely bright light, you can use one 16340 rechargeable Li-ion battery. But if you want the flashlight to run for over a long period of time, then the 3V CR123A Lithium battery will be the most ideal. In case the flashlight falls on a flat surface or ground, it will not roll as it has anti-roll body. Keeping the Fenix pd25 LED flashlight is very easy as it provides the user with a wide range of options. 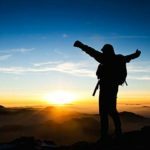 It has a lanyard, holster, and pocket, which can be utilized to attach or store the flashlight safely in the pocket, on the belt or even in the backpack. Its small size also makes it be easy to walk around with in the pocket. Fenix has always been on top of the list when it comes to quality and reliable flashlights. Their products are sturdily made and have outstanding features when compared to other brands. The Fenix pd25 is sturdily built from aircraft grade aluminum. It can be used in extreme weather conditions like cold or rain and still perform well. The flashlight is powered by one 16340 rechargeable Li-ion or 3v CR123A lithium battery. Features such as the over-heat protection, reverse polarity protection, and battery level indicator make using this flashlight to be safe. 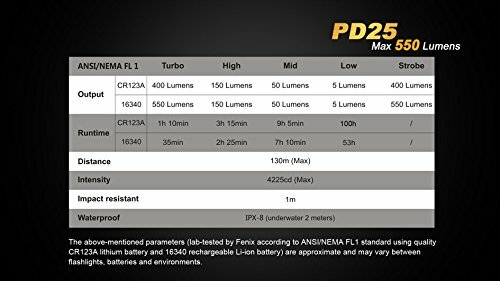 I hope this Fenix PD25 review article has given a clear idea about this light. If you have been looking for a quality flashlight for your outdoor needs, look no further as the Fenix pd25 handheld flashlight offers everything that you might need in an everyday carry flashlight. On top of that, it is a reliable brand.